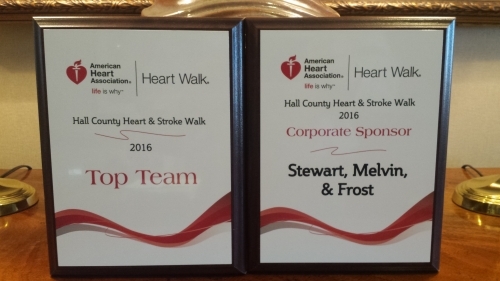 Stewart Melvin & Frost won Top Team in the Hall County Heart & Stroke Walk, raising the most money by a team with $10,075. The effort was spearheaded by Jamie Ryal who coordinates our fundraising efforts. Attorneys Randall Frost and Steve Cornelison took part in the walk.